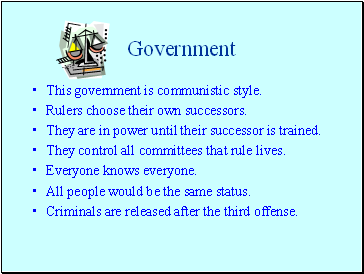 This government is communistic style. Rulers choose their own successors. They are in power until their successor is trained. They control all committees that rule lives. 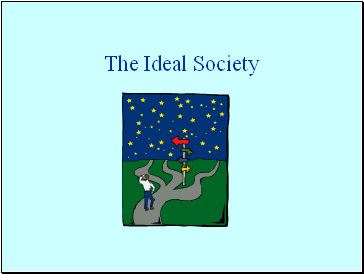 All people would be the same status. Criminals are released after the third offense. 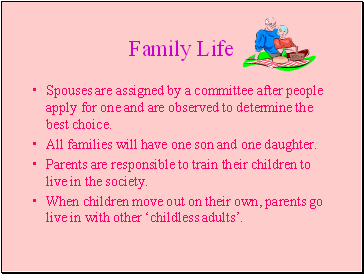 Spouses are assigned by a committee after people apply for one and are observed to determine the best choice. All families will have one son and one daughter. Parents are responsible to train their children to live in the society. When children move out on their own, parents go live in with other ‘childless adults’. All houses look exactly the same, with identical yards, furniture, etc. 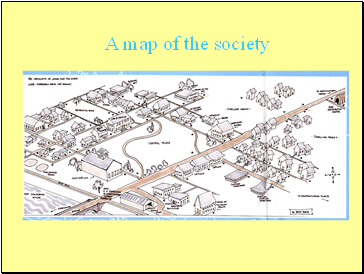 Each family has their own home, but it is owned by the society. Families are assigned to living quarters. 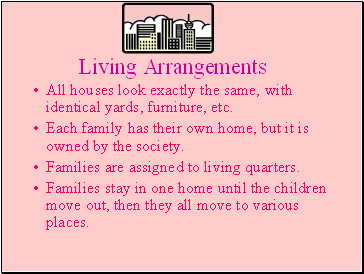 Families stay in one home until the children move out, then they all move to various places. 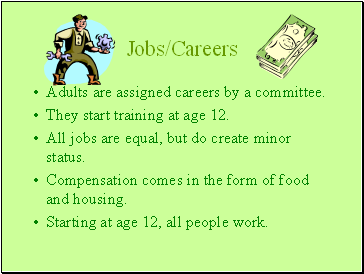 Adults are assigned careers by a committee. They start training at age 12. All jobs are equal, but do create minor status. Compensation comes in the form of food and housing. Starting at age 12, all people work. Children are separated by age. School takes up most of the day, followed by recreation or volunteer work. Children begin school at age three, and continue until 12 when they begin training for their jobs. 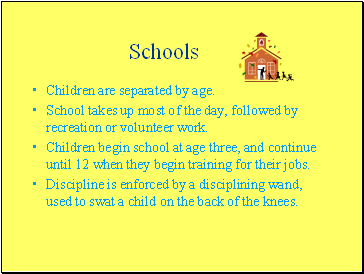 Discipline is enforced by a disciplining wand, used to swat a child on the back of the knees. 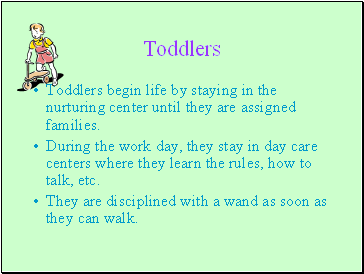 Toddlers begin life by staying in the nurturing center until they are assigned families. During the work day, they stay in day care centers where they learn the rules, how to talk, etc. They are disciplined with a wand as soon as they can walk. 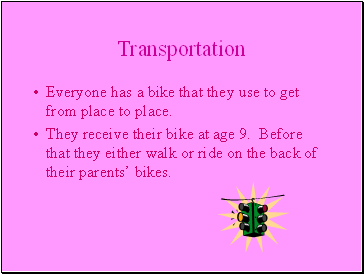 Everyone has a bike that they use to get from place to place. They receive their bike at age 9. Before that they either walk or ride on the back of their parents’ bikes.